Democratic presumptive presidential nominee Hillary Clinton delivers an economic speech that savaged her Republican opponent's business record on Tuesday at the Fort Hayes Metropolitan Education Center in Columbus, Ohio. In a national display to show just how important the "Buckeye State" is for the Democratic Party keeping control of the White House for the next four years, its capital served as their presumptive presidential nominee's venue to stake her claim for being a better steward of the nation's economy than her expected Republican rival come the fall. 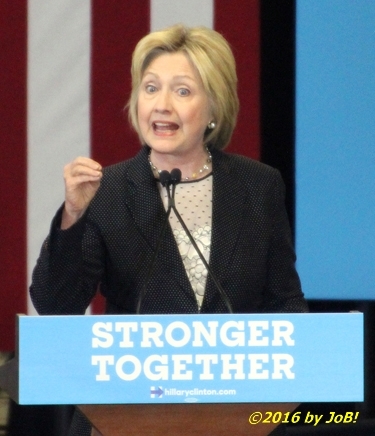 Employing a delivery style that featured both snark and sobriety, former Secretary of State Hillary Clinton provided a sharp lambasting of the business resume of her general election challenger, New York businessman Donald Trump, during an address given Tuesday afternoon at Columbus' Fort Hayes Metropolitan Education Center.